We created wearable sculpture that explores the strength and beauty in a left arm affected by cerebral palsy, as well as how it creates 2 different hemispheres of motion on the body. We created this piece for a dancer named Jerron in the show On Display, a fashion show in New York which showcases four dancers with different disabilities. Jerron is a professional dancer and has cerebral palsy in his left arm. Our project was started by Ben and Acacia, but they decided not to continue it so we took over. When Skyping with Jerron, Ben and Acacia learned that he wanted a fashion piece that would show his strength. He also told them about his fascination with the visual of two different hemispheres. They came up with an idea to use a low-poly design to create two shoulder pads for Jerron. To make them into two different hemispheres, they wanted one side to move while the other stayed still. When we took over the project, we took those two ideas and started from scratch. We Skyped with Jerron multiple times and got to know him and used his feedback on our project. We used a computer-aided design software, Rhino, to design the shoulder pads. We then laser cut the triangular pieces that we had created and assembled them using 3D printed hinges. We made a set of straps with a waistband to attach the pieces to. We laser cut all of the adjustability clips in clear acrylic. 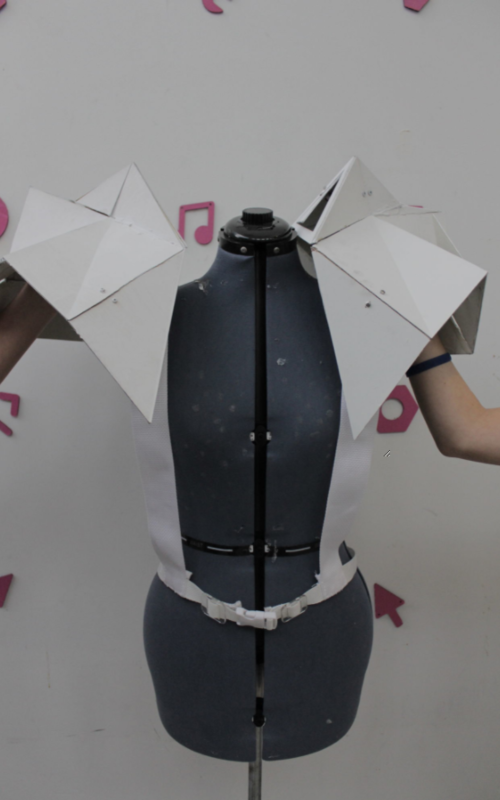 We used dowels to support the shoulder pads and designed 3D printed pieces to attach them to the straps. In order to create the effect of two hemispheres, we decided to keep the right side still while the left side would have moving pieces. We wanted to show the beauty in Jerron's disability and how it can affect the motion of his left hand and arm. We decided to make four of the triangles on the left shoulder pad open up whenever he moved his fingers. To do this, we attached a string to each of the four triangles and tied those to 3D printed rings on his four left fingers. Whenever he or his disability moves his left fingers, the triangles will flutter open, highlighting his disabiliy in an alluring way.